I have a confession: I hate binding my quilts! I have at least a half-dozen quilts that are quilted but not bound. The Front Range Modern Quilt Guild gave away the neatest tool as a door prize at our last meeting. The Binding Tool. Yes, I have two. Since I didn't win the door prize, I bought the white one without remembering I already had the blue one. Innocent-looking little thing, isn't it? OK, OK. Actually, once I watched the video from Missouri Star Quilting Company, I am convinced it might be a really clever little tool. Then trim the seams and press the binding right sides together lengthwise. And start sewing with a 1/4" seam. To make a nice corner, stop sewing exactly 1/4" from the corner. 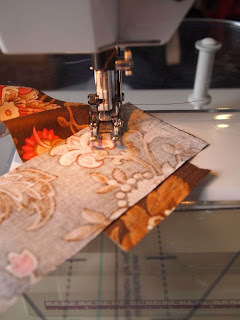 Start stitching right at the fold and continue around your quilt. Form your nice corners three more times, until you get to the second mark you made (remember, it's 12" from where you started sewing). Now we'll use our "Binding Tool" to form a 45 degree seam that joins both ends of the binding. The binding tool has a "warning" printed on it: PRINTED SIDE ALWAYS UP! Remember that as you place the tool and cut the ends off the binding. See that black vertical line at the right hand side of the tool? Make a mark on your binding even with that line. Repeat for the right hand side, be sure the printed side of the tool is right side up! The "Mark Here" vertical line on the tool aligns with the mark you made on your binding. That white chalk line shows where the cut will be (it's moved to the right so you can see it). Be sure to cut off the little dog ear at the corner! Now the left side. This is why I called it a Honey Badger. When you cut the right hand side, the "Mark Here" line is aligned with the mark made on the binding. When you cut the left hand side, align the tip of the tool to the left of your vertical mark. In their defense, the designers DID put a tiny "R" and"L" on the tool, But the directions on the tool are scanty, and I didn't understand how important those little letters were until I watched the video! Cut the left side of the binding along the angled end of the tool, remember to cut off the dog ear! You won't be able to tell where your binding begins and ends! It will be just another diagonal seam, same as when you joined the binding strips together. Besides, now we both need a cuppa and a bit of a lie down to recover. I hated bindings too, so I bought this tool when MSQC had a tutorial on it. I loved it the first time I used it. The problem is, I don't finish many quilts and forget how to use it, so I literally have to watch the video every single time. It doesn't feel much like help anymore if I have to go get my laptop, search for the video and watch it... so the last couple I just "winged it". I know it's helpful if I could just remember the stupid Honey Badger part!!! I am glad to know I am not the only one that finds it unclear. I agree--everytime I use the binding tool I have to watch Jenny's tutorial. I'm going to print off these instructions as it beats watching the video and I found the tool didn't work on the faux piping technique. I watched the video, caught the part about lining one side up on the line and the other side up on the tip, and cut with confidence. And I came up about an inch short. SO...there's a bit of an improv chunk in my binding. :) C'est la vie. I bind that way, but without the tool, I can see how that would make it so much easier! I'll be looking for one. I love binding too! I hate quilting - we could do a trade lol! I tried this tool so many times and wasn't as successful with it as I was using a technique where the ends overlap by the width of the binding. Cut them. Meaning if you use 2 1/2 inch binding they over lap by 2 1/2 inches. Then turn to a right angle to each other and sew your diagonal line. I may give the binding tool one more try after reading your nice little tute on it. Thanks! This is great! But did you ever do the other post showing how to finish the binding?! I've looked but either I'm blind and it's right in front of me....or it isn't there. Help?! choose?.I'm trying to to find things to enhance my website!I assume its ok to use some of your concepts!! Thanks for finally talking about > "Tuesday Tool"